From the Cumberland Gap to the Atlantic Ocean, this is Virginia Water Radio for the week of November 10, 2014. This week, in honor of Veterans Day on Nov. 11, we focus on the “anybody” that did copy and respond to the distress call you just heard: the U.S. Coast Guard. Have a listen to about 45 seconds more of the Coast Guard’s first response to that vessel sinking off Virginia’s coast in April 2010. The Coast Guard began in 1790 as a 10-ship fleet established to enforce trade laws and reduce smuggling. In 1915, Congress merged this fleet—by then called the Revenue Cutter Service—with the U.S. Life Saving Service to form the Coast Guard as a branch of the nation’s military forces. Later, the Lighthouse Service and the Bureau of Marine Inspection and Navigation also became part of the Coast Guard. Today’s missions include law enforcement; national defense and homeland security; marine safety; environmental protection; navigation; and search and rescue activities, from single-person vessel incidents to the roof-top helicopter rescues of New Orleans residents during Hurricane Katrina. Virginia’s connections to the Coast Guard range from George Washington signing the Congressional bill that established the revenue cutter fleet; to life-saving stations in service from the late 1800s to the mid-1900s; to today’s several active units, including the large Portsmouth base, which began in 1870 as a depot for lighthouse equipment. Thanks to the Coast Guard for this long history of service “through surf and storm and howling gale,” as the lyrics say in the Coast Guard anthem, “Semper Paratus,” the Latin for “always ready.” And we close with a short sample of the anthem, played by the Coast Guard Band. 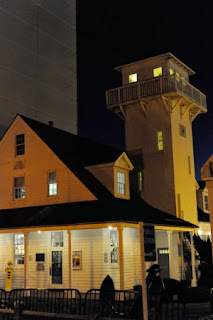 Old Coast Guard Station in Virginia Beach, Va., October 17, 2014. Photo by Coast Guard Petty Officer 3rd Class David Weydert, accessed online at http://www.dvidshub.net/image/1636546/old-coast-guard-station-virginia-beach#.VGDt6sm_4_s. U.S. Coast Guard Cutter Shearwater (right), escorting vessels during Operation Sail 2012 in Norfolk, part of the commemoration of the 200th anniversary of the War of 1812. 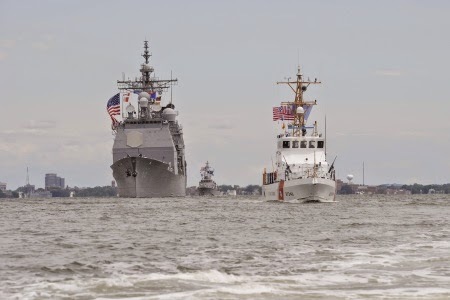 Photo by Coast Guard Petty Officer 3rd Class David Marin, accessed online at http://www.dvidshub.net/image/595969/coast-guard-leads-parade-ships#.VGDspMm_4_s. Old Coast Guard Station, Virginia Beach, Va., Web site, http://www.oldcoastguardstation.com/. “About Us,” online at http://www.uscg.mil/top/about/. “Life-Saving Service and Coast Guard Stations,” online at http://www.uscg.mil/history/stations/StationIndex.asp. “U.S. Coast Guard and Hurricane Katrina,” online at http://www.uscg.mil/history/katrina/katrinaindex.asp. “U.S. Coast Guard in Virginia 2013,” online (PDF) at http://www.uscg.mil/publicaffairs/statedatasheets/VIRGINIA.pdf. USCG Base Portsmouth, Virginia, Web site, http://www.uscg.mil/baseportsmouth/. Episode 187, 11-11-14: Music in Honor of Veterans' Day and Our Armed Forces' Connections to Virginia Waters. Episode 214, 5-19-14: "Dirty Sea," by Chamomile and Whiskey, for National Safe Boating Week.